Many golfers struggle on the greens because they often make what is in reality a fairly simple physical action, much more difficult, mainly through thinking too much about the mechanical action of their putting stroke. When the physical aspects of putting take over it can often lead to a loss of feel for your putts and good feel is essential, both for your stroke and also when it comes to judgement of distance. So if you are experiencing problems with this aspect of your game try this simple drill that will help get that essential feel back into your putting stroke. 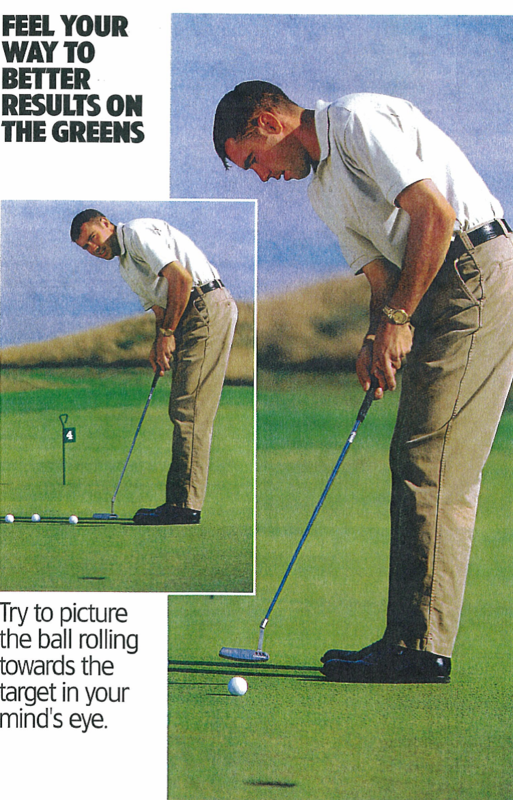 Next time you have a few minutes to spare prior to a round of golf or even during a practise session, find a quiet spot on the putting green and try this simple drill. Take up your normal putting stance, but before you actually hit the ball, take several practice strokes looking directly towards the hole instead of down at the ball. Try to visualise the length and pace of stroke that would be required to roll the ball the required distance. And if possible, try also to picture the ball rolling towards the target on the given line and into the hole in your mind’s eye. As you swing the putter gently back and through, you should start to become much more aware of the weight of the putter head and the pace of your stroke. You will soon discover that your natural feel for distance and pace will become the dominant factors in your putting stroke, rather than the physical mechanics of the stroke. Then when you get out onto the golf course, try to introduce the same “feel” drill into your pre – shot putting routine.